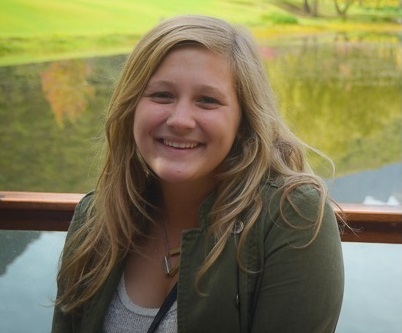 Carrie is a local high school student who volunteered around our office during the entire month of June. She helped with office tasks and book labeling. Thanks Carrie! These 3 students from Northwest Missouri State-Kansas City Campus created over 300 of our kindergarten book bags! 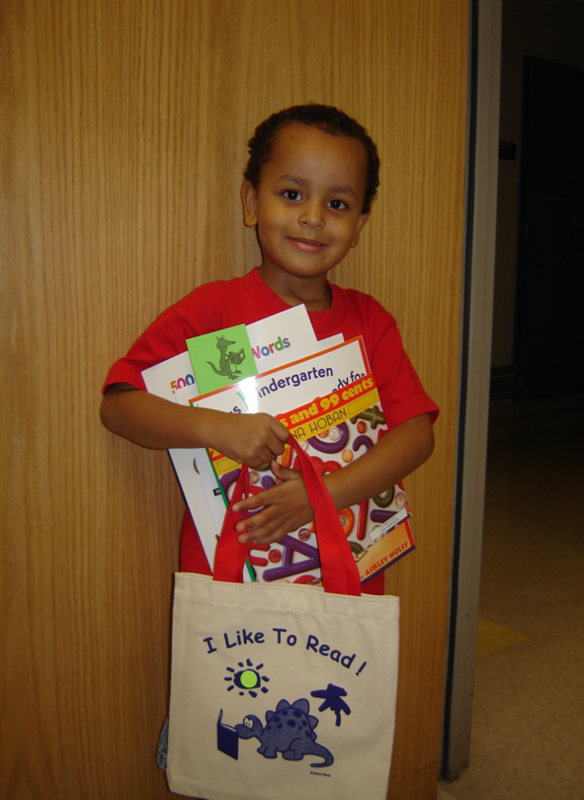 These bags include important information about beginning school & how to register for Kindergarten. Thank you! 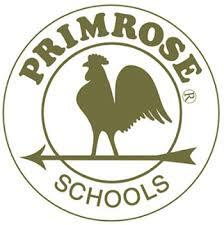 Thank you to the Primrose Adventure Club! 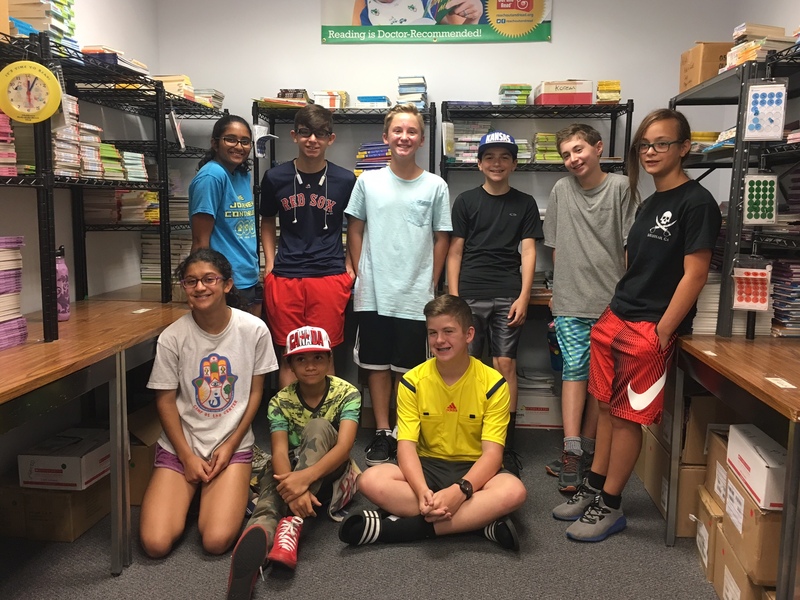 These campers volunteered their afternoon to help label hundreds books for us. 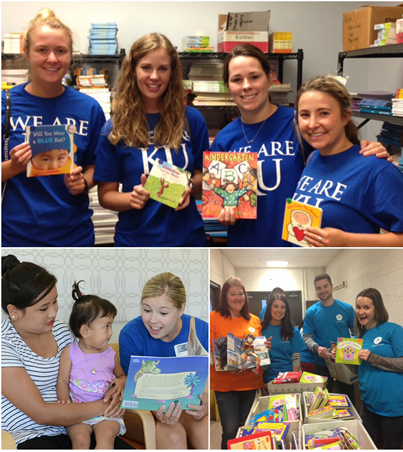 UMKC Medical Students held a book drive for RORKC this summer, collecting a ton of new and gently used books for our partner clinics. Thank You! These campers, from the Jewish Community Center J-Camp, volunteered their morning to help label books. You guys are awesome! Thank you to all of our summer volunteers! 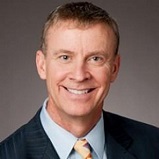 A new study from Dr. John Hutton (pediatrician and clinical researcher at the Cincinnati Children’s Hospital Medical Center) and other researchers, found that children’s books with messaging about safe sleep practices are more effective in changing parents behaviors than traditional brochures. Sleep- related infant deaths (categorized as children under 1-year-old who die unexpectedly) disproportionately affect lower income families. 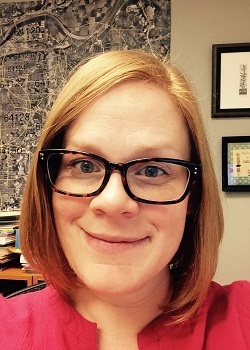 Researchers were interested to see if children’s picture books with safe sleep messaging would educate parents more than traditional methods, like brochures and pamphlets. 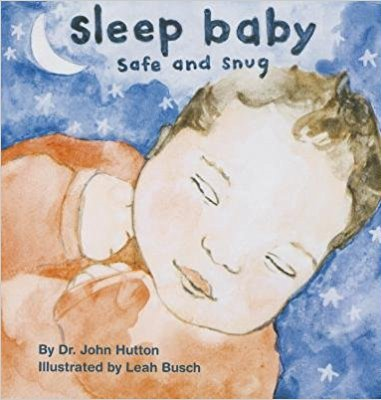 To test this, researchers provided families with the book, Sleep Baby, Safe and Snug, by Dr. John Hutton. 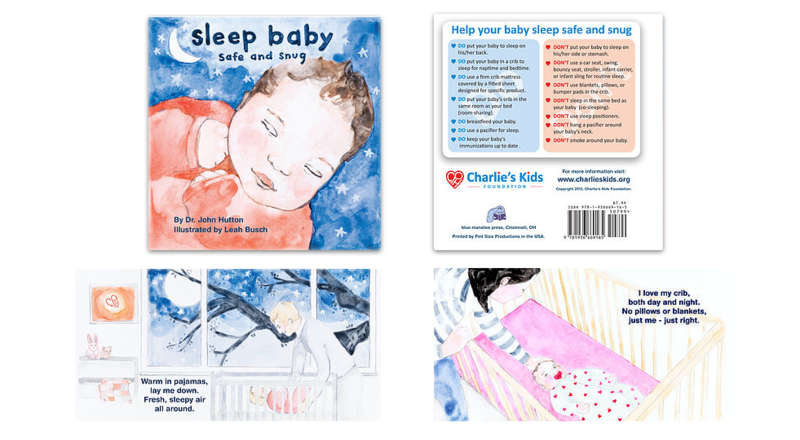 Sleep Baby, Safe and Snug is a story filled with safe sleeping practices for new babies. It even includes a checklist of “Dos and Don’ts” on the back cover as a reference for parents. It is also the book that RORKC provides at the one-month well-child visit. For the study, researchers specifically targeted lower income families. 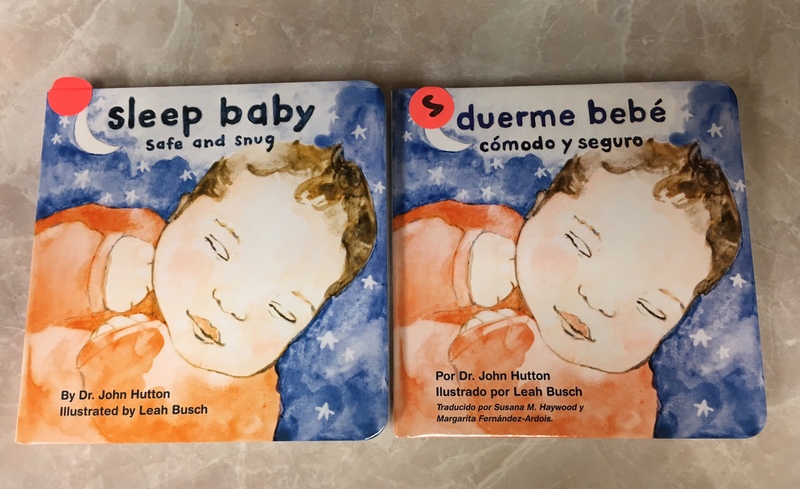 While they conducted their research in primarily English-speaking households, Sleep Baby, Safe and Snug, is also available in Spanish to families at RORKC’s partner clinics. 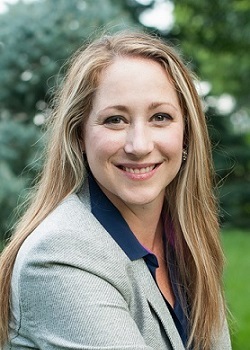 They found that while both the pamphlets and Sleep Baby, Safe and Snug were similarly effective in educating parents on safe sleep knowledge, parents who had the children’s book were less likely to share beds and more likely to use cribs exclusively. The researchers attributed this to the idea that reading the book aloud provoked more dialogue and emotional engagement, meaning that they were more likely to follow the advice after they had shared the book with their child. While the researchers caution that there should be more investigation into the best practices for educating parents on safe sleeping habits, they believe that providing children’s books, like Sleep Baby, Safe and Snug, may be a step in the right direction. Only One Week Left to Get Tickets for the 20th Birthday Breakfast! Tuesday, April 11th, is the last day to purchase your tickets for RORKC’s 20th Birthday Breakfast. Get them now, before they’re gone! 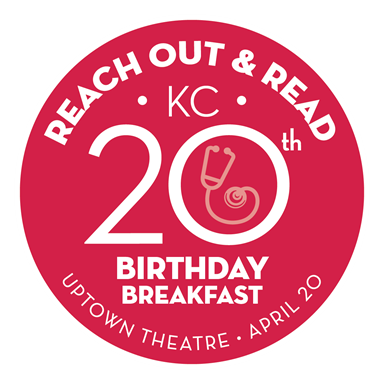 To celebrate 20 years of providing literacy advice and over 1 million books to kids in KC, we’re hosting the 20th Birthday Breakfast fundraiser on Thursday, April 20th, from 7:30- 9 am at the Uptown Theater. Join us for a morning of fun including breakfast, birthday cake, a ceremonial toast by Honorary Hosts, Pamela Miller and Michael Cummings, and entertainment by Jim Cosgrove. 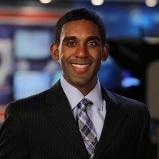 Dhomonique Ricks, anchor from FOX-4 TV, will also be joining in on the celebration as the Master of Ceremonies. 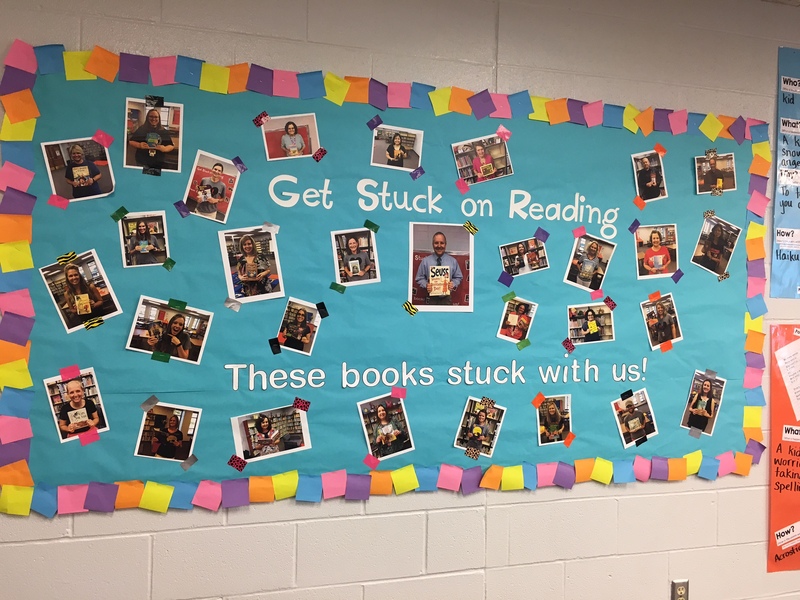 Hooked On Books Challenge 2017 Was a Huge Success! 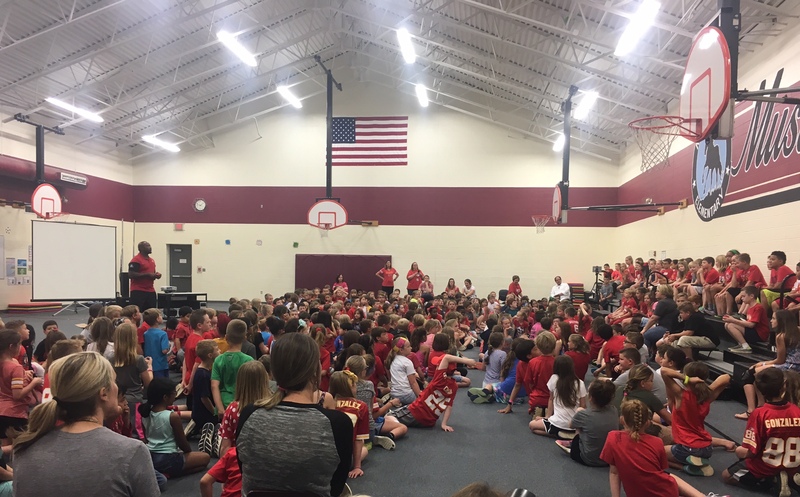 This year, the Hooked On Books Challenge collected over 24,000 gently used books from 20 elementary schools on both sides of the state line and Rainy Day Books. 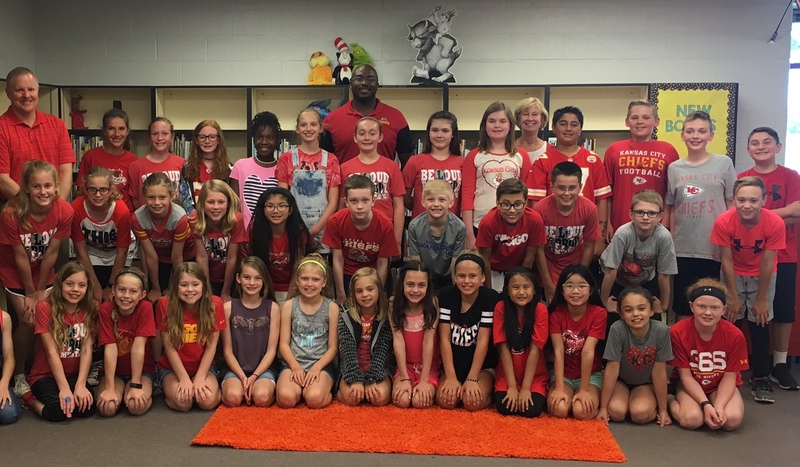 Congratulations to Manchester Park Elementary, from the Olathe School District, for collecting the most books, an average of 12 books per student! These gently used books will be distributed throughout our partner clinics and other literacy agencies. 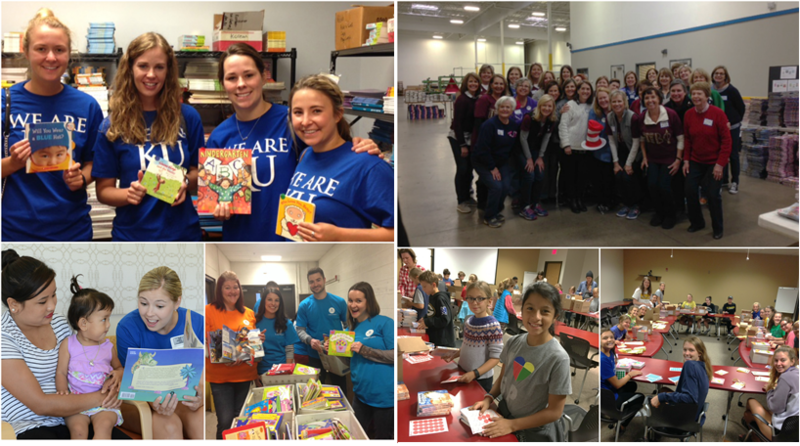 On March 25th, 52 volunteers joined us at the Kansas City Star to help sort books. Each book was labeled with a “Hooked On Books” Sticker and sorted into an appropriate reading level category. 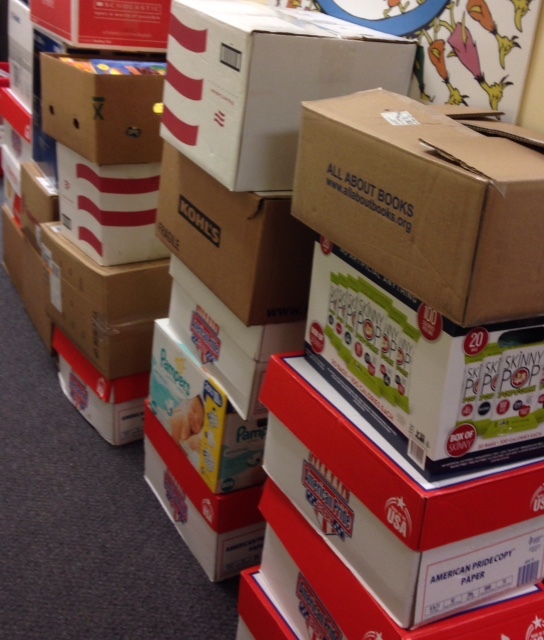 Over 11,000 books will be sent to RORKC’s partner clinics for children in the waiting rooms. 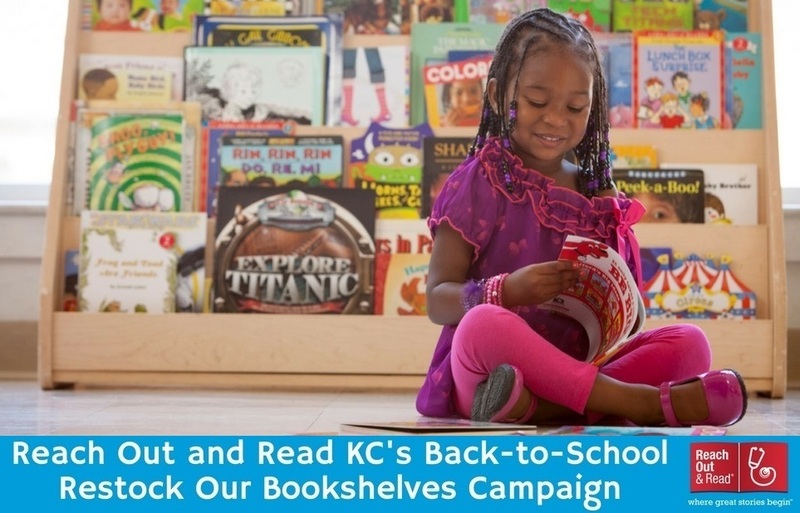 The rest were donated to other great Kansas City organizations, such as the Urban Scholastic Center, COR Bookmobile, KCK Public Libraries and more. 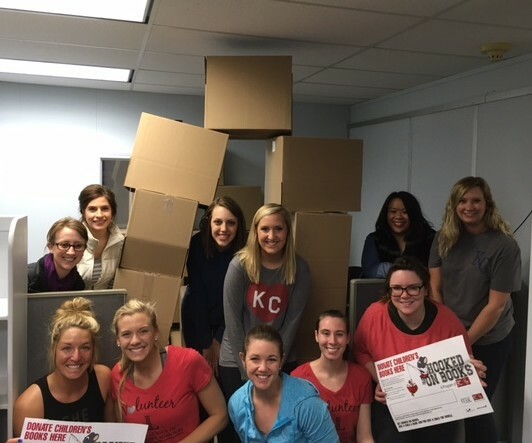 A special thank you to the 20 Junior League of Kansas City volunteers for their help sorting and labeling books, to The Kansas City Star for storage and printing, and to the 18 Cerner volunteers for helping us deliver these books to the great organizations. 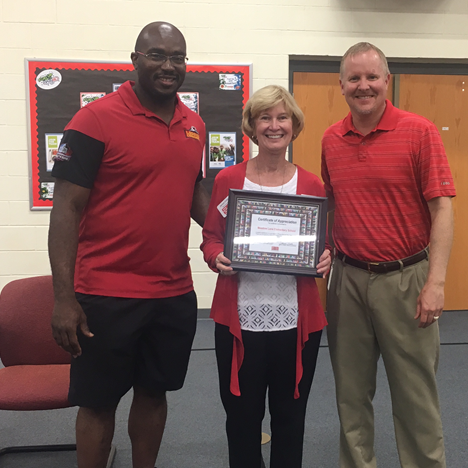 Thank you to all that helped us make this year’s Hooked On Books Challenge a success! 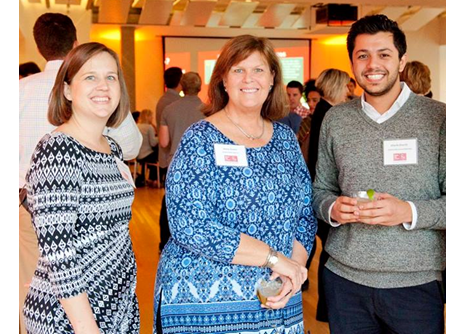 We’re seeking new members for our community leadership and advisory council. This is a great opportunity for anyone with a record of leadership and passion for RORKC’s mission. The Community Council supports the work of Reach Out and Read Kansas City and provides mission-based leadership and strategic governance. 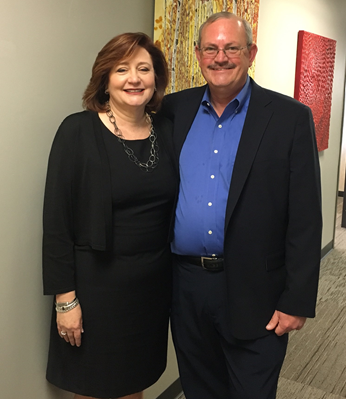 While day-to-day operations are led by ROR’s Executive Director, the Council/Director relationship is a partnership, and the appropriate involvement of the Council is both critical and expected. Qualified applicants will be leaders in business, government, philanthropy, the medical field, or the nonprofit sector. Advocacy: Actively champion and advocate for a call to action related to early literacy and kindergarten readiness causes. This includes but is not limited to sharing Reach Out and Read Kansas City’s message and news about programs and events through personal and professional networks as appropriate. Committee and event participation: Members are asked to actively participate in at least one standing committee and to support the annual fundraising breakfast through the purchase of a ticket and/or their attendance. Ambassador responsibilities: Attend and/or volunteer at least one third-party sponsored meeting or event as an “official” representative of Reach Out and Read Kansas City. Attendance: The Council meets bi-monthly on the second Friday of the month, from 11:30a-1:00 pm at the Reach Out and Read office located at 2100 W. 36th Ave., Kansas City, KS 66103. Members are asked to attend these meeting on a regular basis and send advance notification for an excused absence. Length of service: Members are asked to commit to serving a minimum of three consecutive years on the Council, with the opportunity to re-up for an additional three-year term. Terms coincide with the organization’s fiscal year which begins on July 1 and concludes June 30. Financial commitment: There are no annual dues or minimum financial requirements associated with Council membership. Members are encouraged to support Reach Out and Read Kansas City by making a financial contribution in an amount that is meaningful to them. In addition, members are asked to assist with identifying potential donors and/or event sponsors. Staff will approach and cultivate these opportunities. Last semester, four high school students became volunteer readers at our partner clinics. 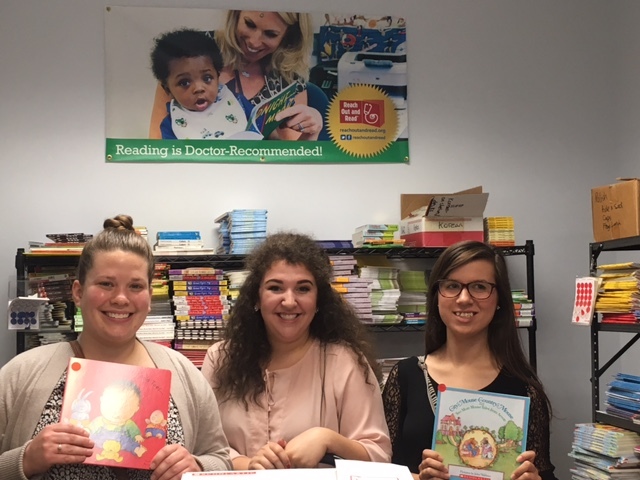 Once a week, these students from the Northland Center for Advanced Professional Studies (CAPS) medical program, spent their morning reading to children and surveying how they felt about reading. These students are interested in a career in the medical field and spent their semester participating in a service learning project. 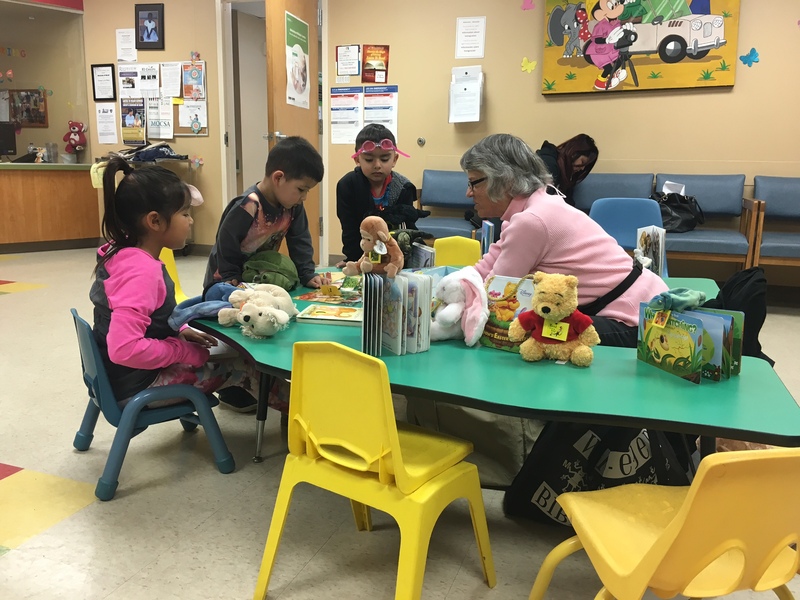 The four volunteers found that a large majority of the children they read to came from primarily Spanish speaking households. This presented challenges for the group, but they realized that these children, even if they only knew some English, enjoyed sharing books with them in the waiting room. Additionally, the CAPS students created a project to research the effects of reading on children’s well-being. They presented the children with a mood scale before and after they read to assess if reading had any impact. Overall they found that children’s mood increased after sharing a story in the clinic waiting room. 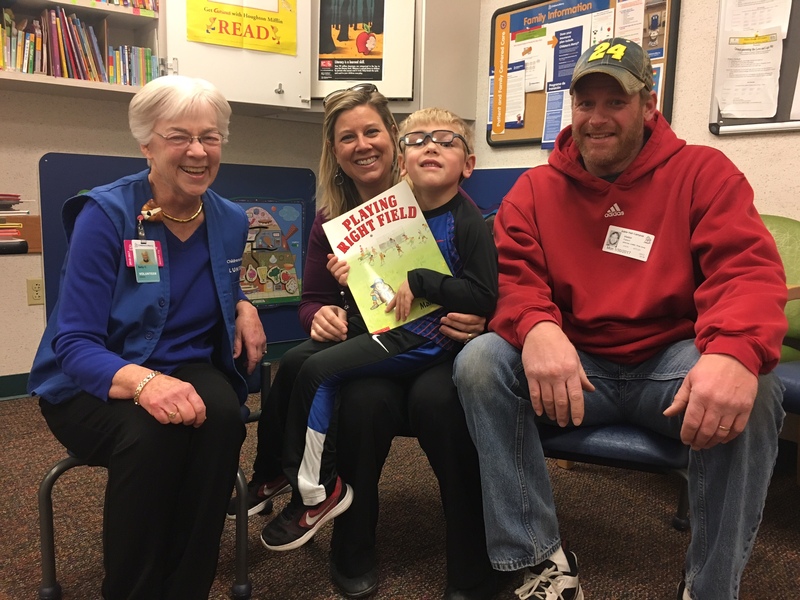 When asked about their favorite memory from volunteer reading at the clinics, they said, “being able to see all the kids’ smiles and realizing that reading can make a huge difference in their life.” Thank you Northland CAPS volunteers! 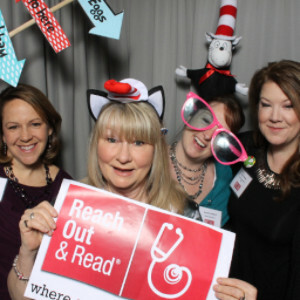 Video Presentation of Reach Out & Read KC’s 1 Millionth Book! 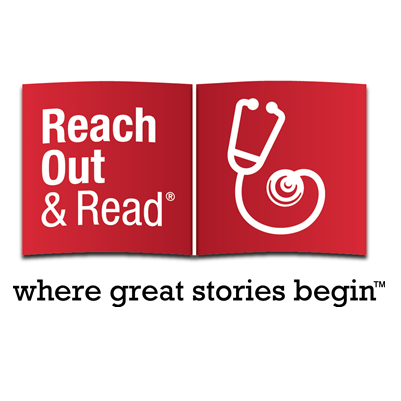 On Tuesday, December 2nd, Reach Out and Read KC provided our 1 millionth book at the University of Kansas Medical Center’s Pediatric Clinic. The millionth book was presented to a local family after their 4th month old son’s well child visit. Watch highlights from the presentation below! Sponsorships Available for RORKC 20th Birthday Breakfast! 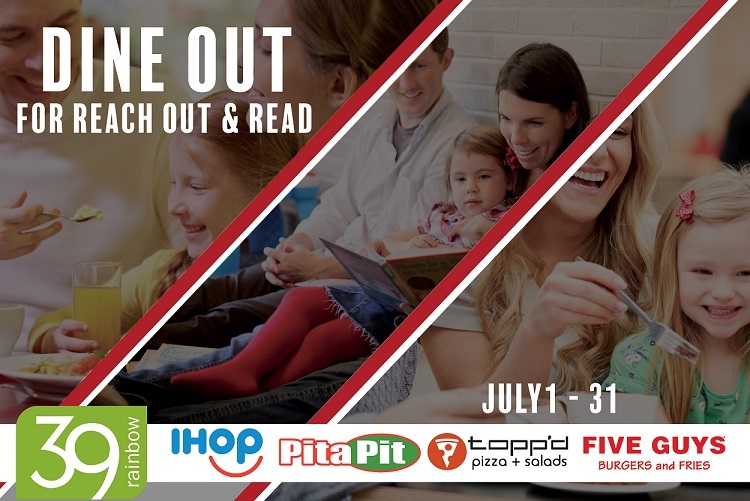 2017 is Reach Out & Read Kansas City’s 20th year of providing new, developmentally appropriate books to children and important literacy advice to parents! 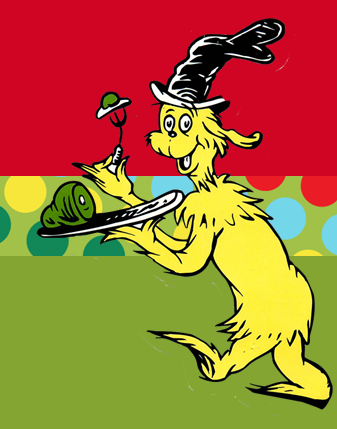 Because we have something extra special to celebrate, we are replacing our Green Eggs & Ham event with our 20th Birthday Breakfast. The event will occur on April 20th, 2017 from 7:30-9 am at the Uptown Theater. Coffee and registration will begin at 7am. Ample and adjacent free parking is provided. Join us in celebrating by becoming a sponsor for the 20th Birthday Breakfast. Whether you are an individual, small business owner, or representative of a large corporation, we offer a variety of sponsorship levels and benefits. 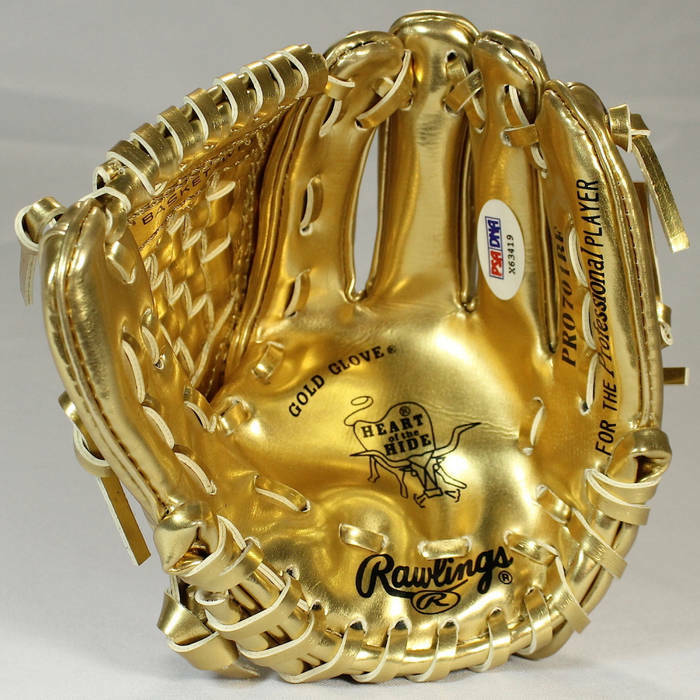 We also invite gifts made in memory or honor of someone special. View more information. A big thanks to all you Macy’s Cardholders who joined Macy’s Thanks For Sharing. 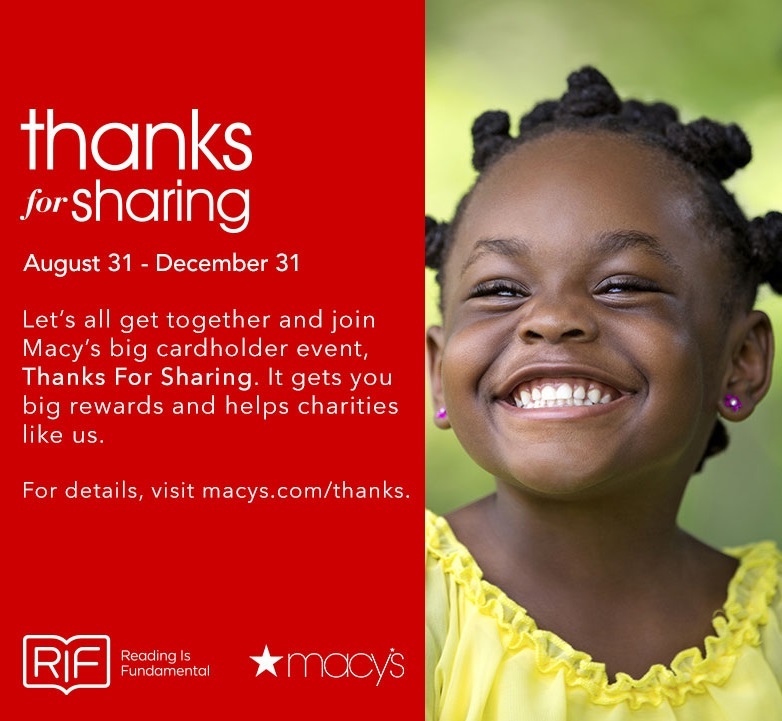 As the result of a partnership between Macy’s and Reading is Fundamental (RIF), the Thanks for Sharing campaign raised $15 million for charities like us! 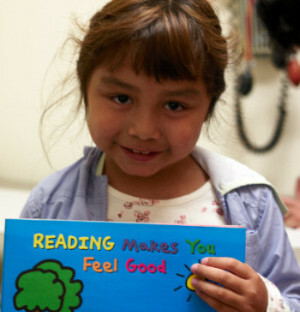 This means more books for kids in our clinics. We are so grateful to Macy’s, RIF, and all who supported us in this campaign. Thanks for Sharing will continue until December 31, so there is still time to enjoy the savings! Visit any Macy’s store to learn more. Our 2016 Year in Review report is here, and we are helping more families than ever. 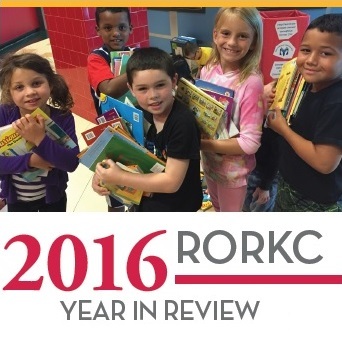 Between July 1, 2015 – June 30, 2016, RORKC distributed 83,672 books. That’s over 6,000 more than the last fiscal year! To see more of what we have accomplished recently, and to hear from some of our volunteers and medical providers view the full report. 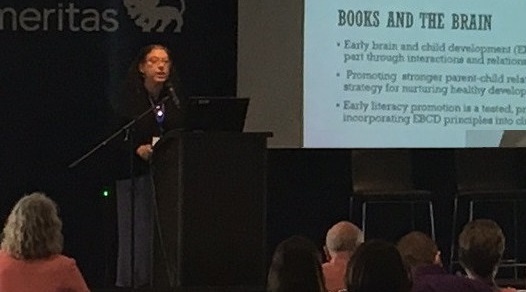 The Reach Out and Read program and message of “Books Build Better Brains” took center stage on September 22, as Dr. Perri Klass, National Medical Director of ROR presented both the morning’s keynote speech and a subsequent working session to an audience of 200 pediatric care providers. 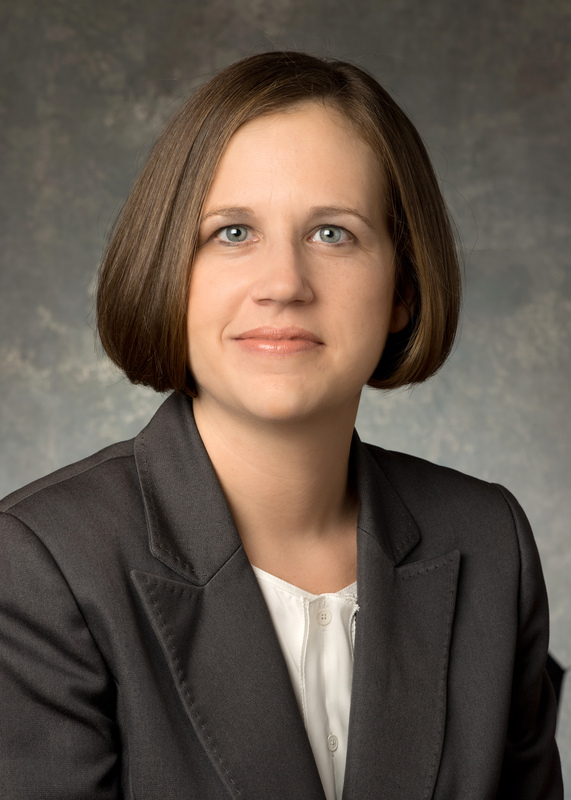 Klass was the featured speaker at the 49th Annual Clinical Advances in Pediatrics Symposium, presented by Children’s Mercy Hospitals and Clinics at Children’s Mercy Park. 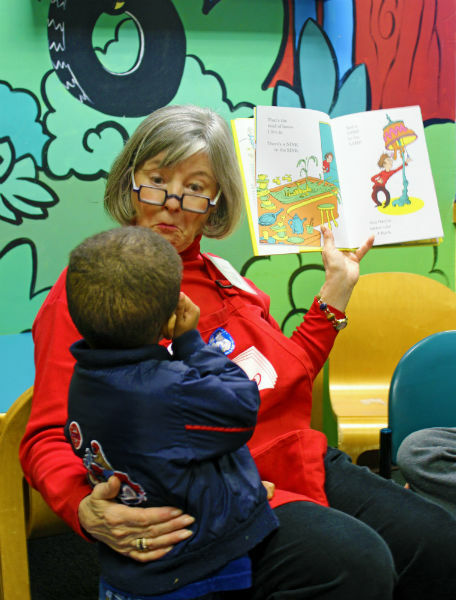 She explained and provided evidence supporting the many benefits young children garner by being read aloud to. 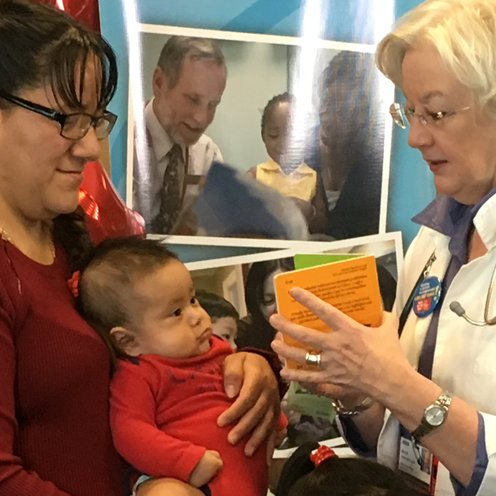 Additionally, she urged attendees to take advantage of the special relationship between families and pediatric providers to support parenting practices that promote early brain development through literacy-related practices. 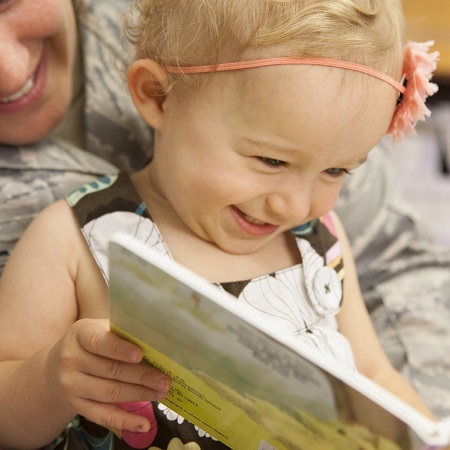 Dr. Klass suggested the message to parents should include, “your baby will love books, because your baby loves you,” and therefore will love and look forward to time spent together sharing books. The Reach Out and Read program has a huge impact on every family we serve because we are able to provide books that meet the specific needs of different families. 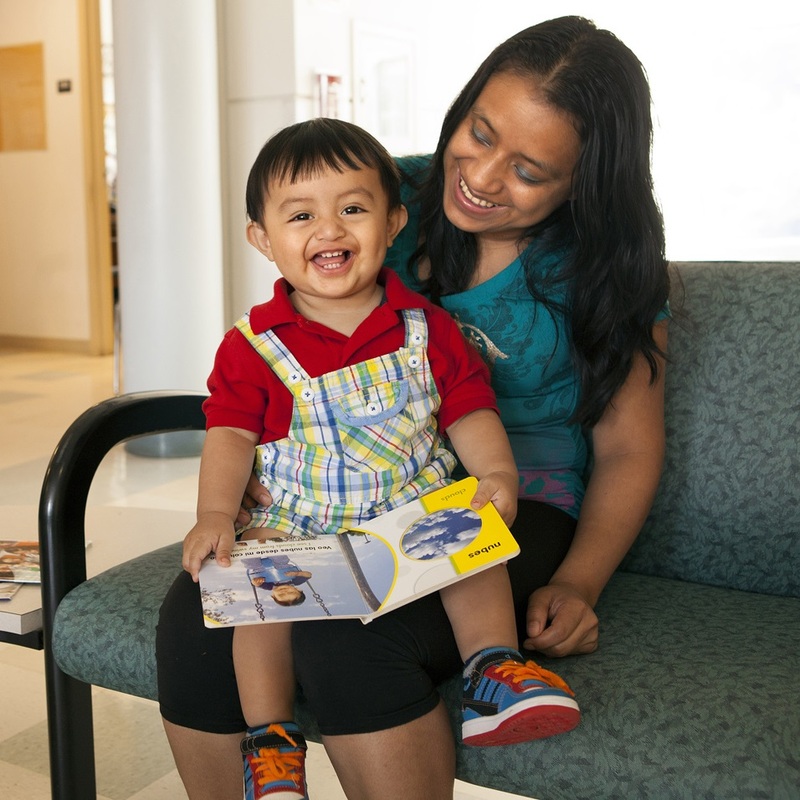 Our clinics encounter patients who are culturally diverse and often unable to read or speak English. For these families, we offer bilingual and foreign language books in 27 different languages from Arabic to Vietnamese at well-child visits for ages 0-5 years old. Children in these families will usually go on to attend an English-speaking school, making bilingual books especially valuable in helping them get ready for kindergarten. 1. Bilingual books encourage parents to read in their home language. Parents who do not speak any or very much English may not be comfortable reading English-only books to their children. Being read and talked to (in any language) is important for building those pre-literacy skills so babies can be ready to learn once they start school. Strong pre-literacy skills in the child’s home language prepare their brains to learn reading or writing and improve their capacity to learn both languages. 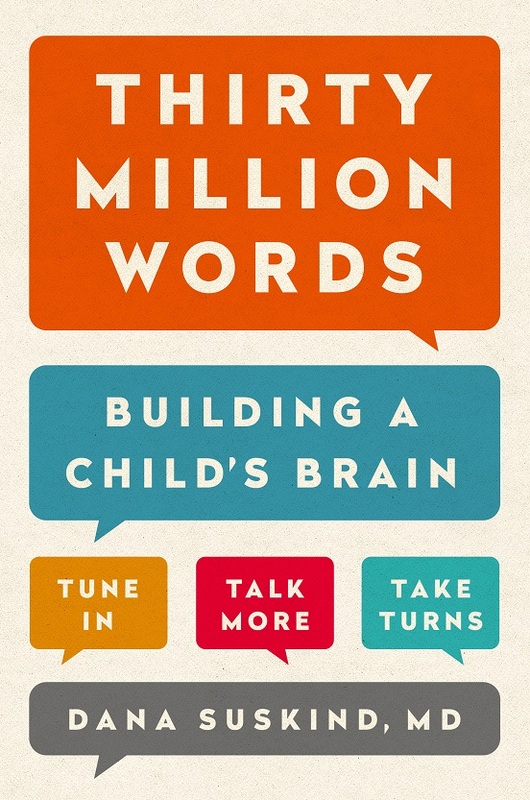 For very young children, learning a language is not the only goal: Building strong neural connections is also important. Somali is one of our 27 languages for bilingual book options. 2. Bilingual books build vocabulary in both languages. Bilingual children may have smaller vocabularies in each language than their peers (though their combined vocabulary is often the same or greater). This can become a problem once they begin school, especially since “playground language” does not expose children to concepts that they need to know for school in their second language. Bilingual books familiarize children with “academic language” in both language, preparing them to succeed in kindergarten and beyond. 3. 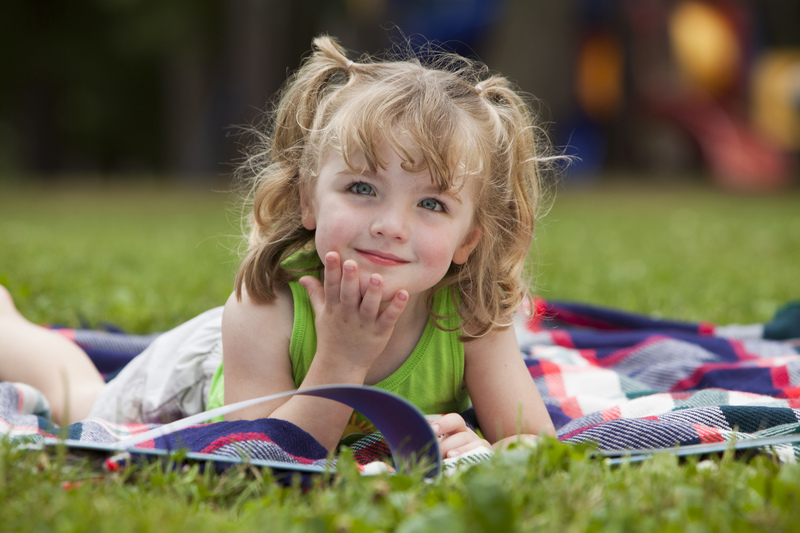 Bilingual books help children feel included. It is important for children to find themselves represented in stories and illustrations. If their family speaks a language that is not common where they live, they may begin to feel alienated. For languages like Burmese and Urdu, it can be hard to find any resources for children at all. 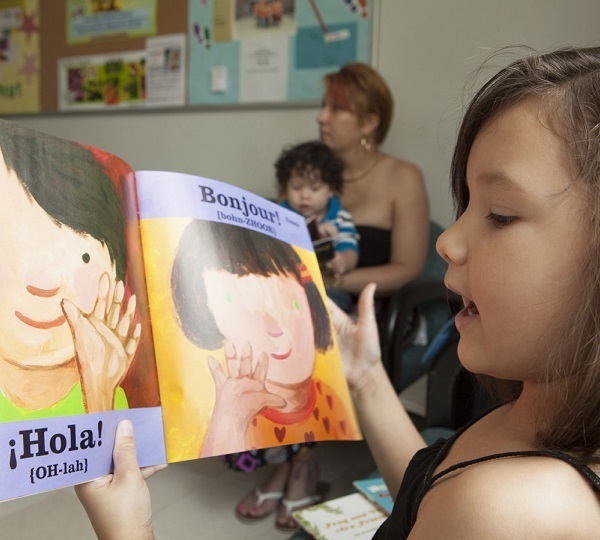 Bilingual books and foreign language books can provide children with much-needed representations of their home language, or even their race and culture. 4. 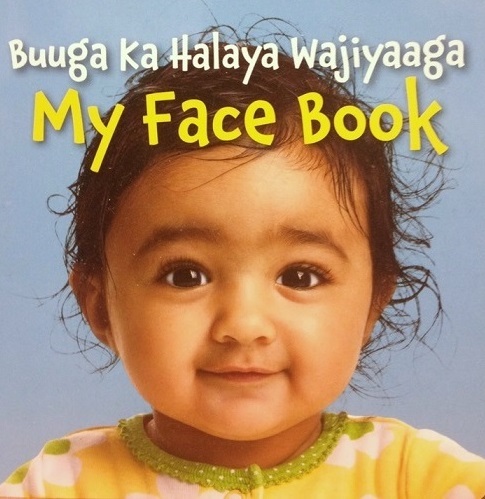 Bilingual books highlight other cultures. Bilingual books are also a wonderful way to help young children learn about and become more accepting of other cultures and people. Learning about other people can boost children’s social and emotional development. 5. Bilingual books are fun. 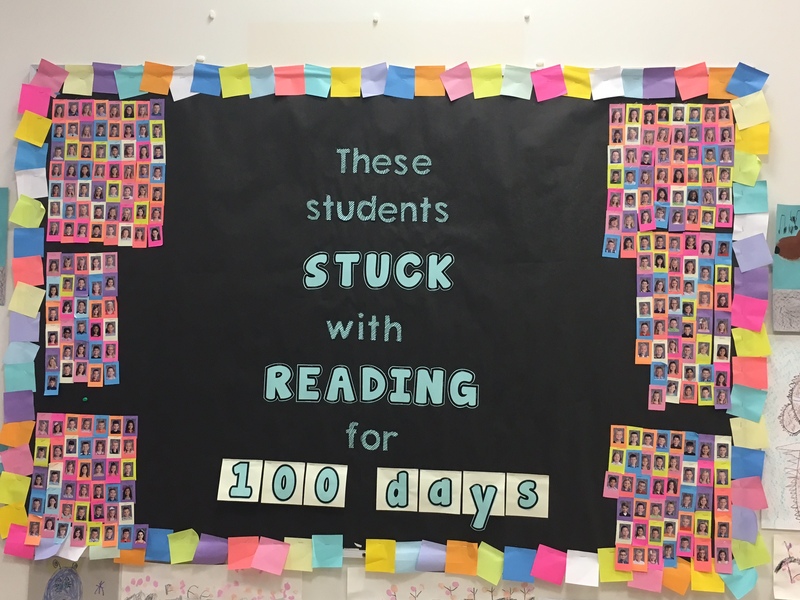 We know reading is a lot fun. Languages can be fun too! 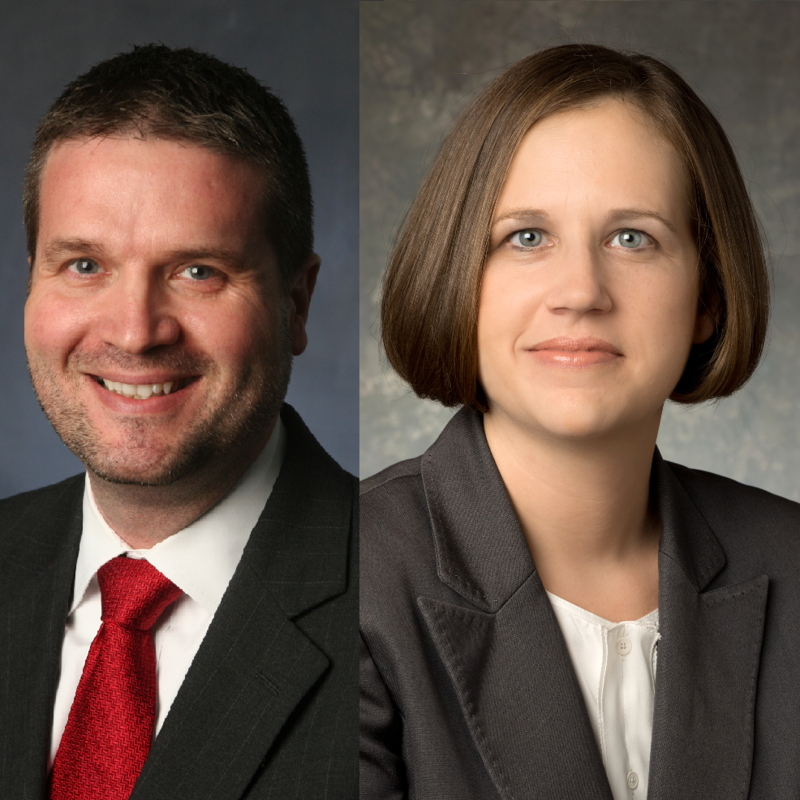 Reach Out and Read Kansas City is pleased to have four new members on our Community Council. 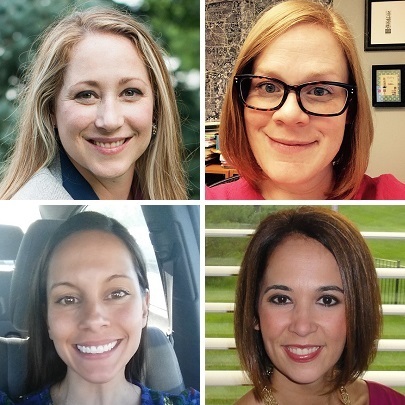 Join us in welcoming Ashley Bieck, Liz Vasquez, Mary Olive Thompson, and Kathleen Johanson. 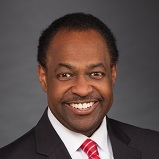 I have dedication for helping the underserved in the Kansas City community and have tried to focus my volunteer career life on programs related to health, housing and hope. I would welcome the opportunity for additional service. And, that is what it is, service to an organization you are passionate about. 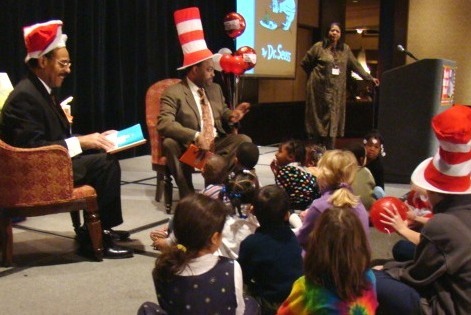 I find these same principles in the Reach Out and Read program and would love to provide my skills and sweat equity to help RORKC continue to build the personal library of children across the metro, create a reading-rich environment, and encourage parents and caregivers to read aloud to their children. My love for reading and sharing bedtime stories with my son is why I want to join the Reach Out and Read Community Council. I will never forget the first time my son read along with me during his favorite bedtime story, “Old Hat, New Hat.” Oh, the joy! He was barely two-years-old but had already become a voracious reader. I started reading to him before he was born and he was reading on his own by the time he turned three. I started reading at a young age and was encouraged by my parents greatly and some of my fondest memories are of my parents reading to me nightly, us reading out loud together, and going to library readings. All of these early opportunities aided in writing, comprehension for later tests through school, and helped in general with all of my school subjects. Reading and writing have been a very big part of my life, and I would like to pass this on to other families throughout my work career. 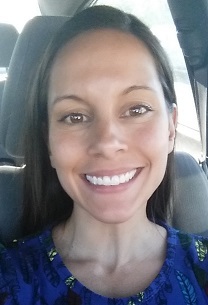 We are thrilled to welcome our new Communications Specialist, Sydney Milner. 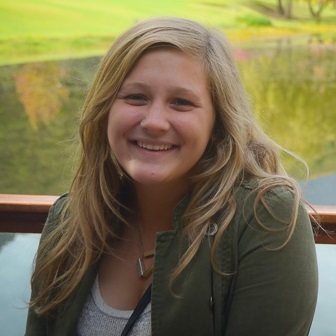 Sydney joins our team as a full-time volunteer through the AmeriCorps VISTA program. 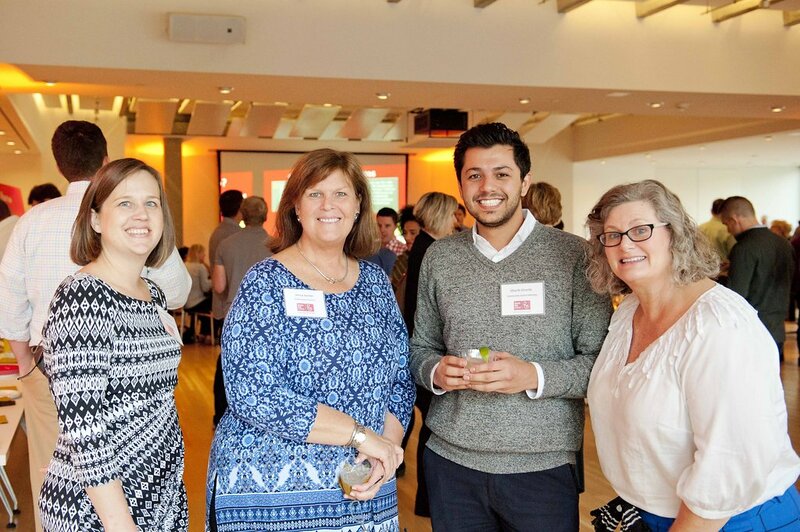 RORKC invites young professionals to attend its 5th annual Books on TAP fall fundraiser on October 19, at the 1900 Building, located at the corner of Shawnee Mission Parkway and State Line Road . Come together with friends -old and new- to celebrate RORKC’s mission of preparing our community’s youngest children for success by incorporating books into pediatric care and encouraging families to read aloud together. Drinks, light fare and entertainment will be provided. 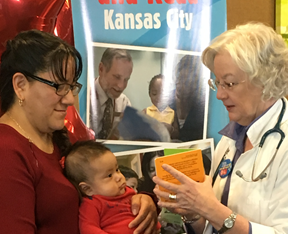 Every year, Reach Out and Read Kansas City provides more than 83,000 new, culturally, and developmentally appropriate books and literacy advice to nearly 30,000 low-income children, birth to age 5, and their families during well-child visits at 51 partner clinics located throughout the metro. Through Reach Out and Read, each child can build a 15-book library before they enter kindergarten. For many families, these are the only books in their home. By attending Books On Tap, you are providing enough support to purchase 5 books – a full third of their 15-book library! 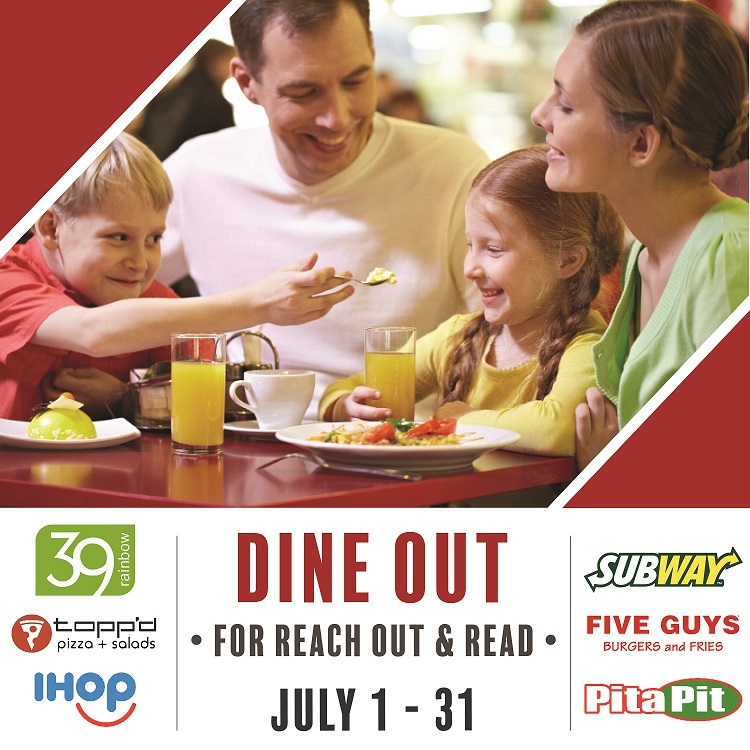 Dine at select 39th and Rainbow Blvd restaurants during the month of July and RORKC will receive a portion of the proceeds. Eateries include Five Guys Burgers and Fries, topp’d pizza and salads, IHOP, Subway, and Pita Pit (to open in late July). Also, bring your new or gently used book donations to the 39th and Rainbow Holiday Inn Express lobby for our month-long book drive! Thank you to LANE4 property group and Page Communications, as well as our neighbors at 39Rainbow for making this happen! 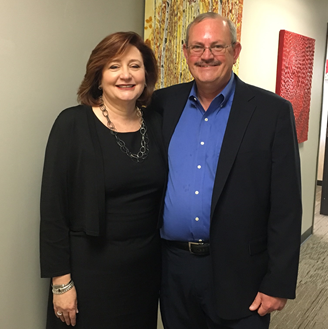 RORKC’s Executive Director, Mark Mattison, and Medical Director, Sallie Page-Goertz, attended the ROR National Conference in Boston, May 11-13. Of greatest benefit to them was getting together with leadership of other Reach Out and Read programs to share ideas and best practices, as well as a wonderful opportunity to put faces to names and voices of folks we work with regularly around the country. On multiple occasions throughout the conference RORKC was acknowledged as an exemplary program. 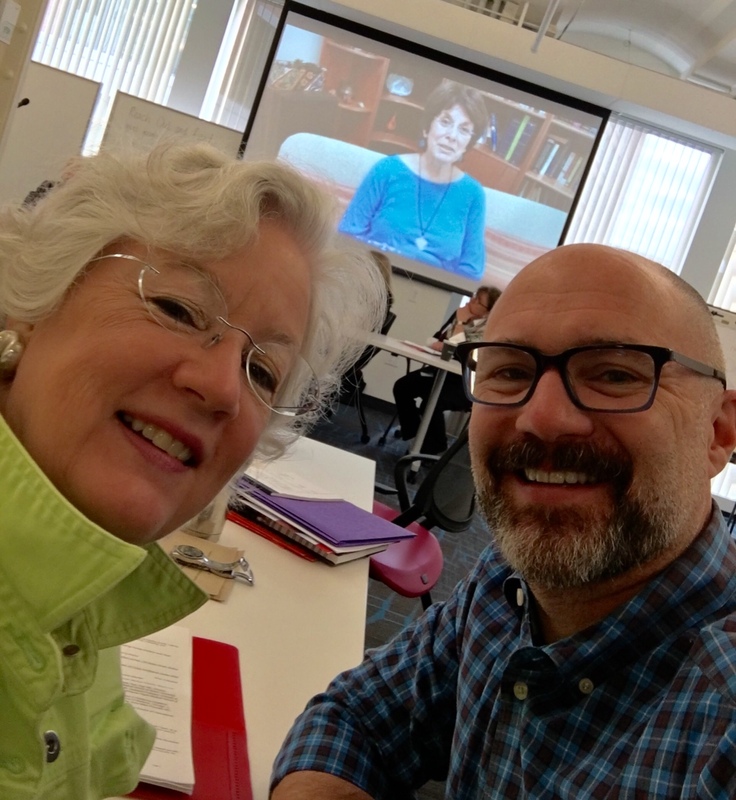 Most significantly, a video of our founder, Dr. Jean Harty, was used to introduce the session on implementing the 0-6mos program nationwide, acknowledging her insistence that it always be a part of KC program. 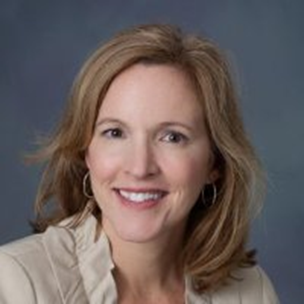 Other takeaways of note were a commitment from National to begin providing content for grant applications connecting outside research in early brain development to the ROR program, and Sallie connecting with other nurse practitioners and making plans to present together on the ROR program at the National NP Conference this summer. The conference was sponsored through a generous grant from the Carnegie Corporation of New York and other corporate sponsors. Volunteer reader Anne reads a Dr. Seuss book in an ROR clinic waiting room. Our regular volunteers include clinic volunteers and office volunteers. 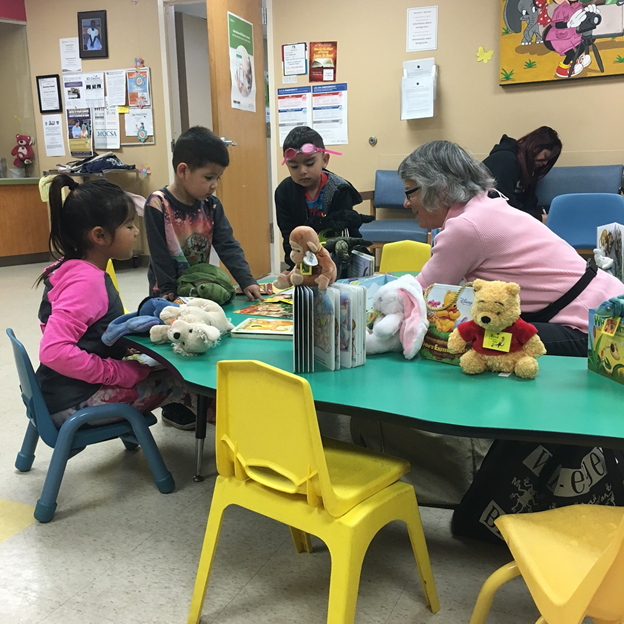 Volunteer readers assist clinics in creating a literacy-rich waiting room environment by sharing stories with children waiting for their doctor’s appointments. This models behaviors for families, like dialogic reading, and gives the kiddos something fun and positive to do while waiting (and it gives the parents/caretakers a short break!). 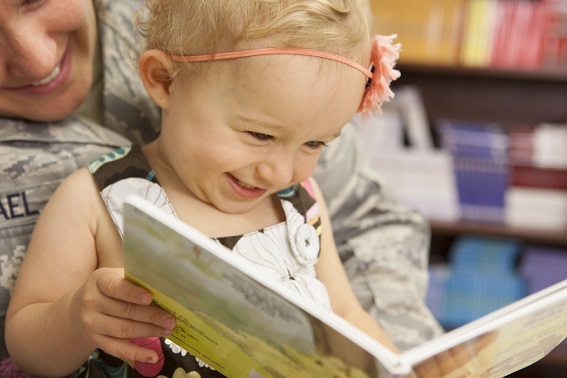 This work isn’t just nice: It is one of many ways to encourage children to read, and this behavior is absolutely critical to their development. 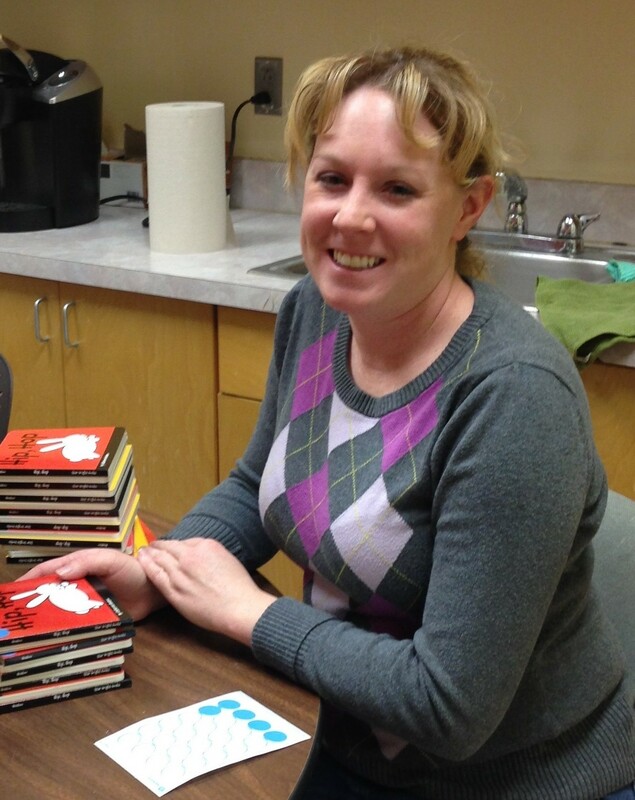 Office volunteer Allie labels books for well-child visits. 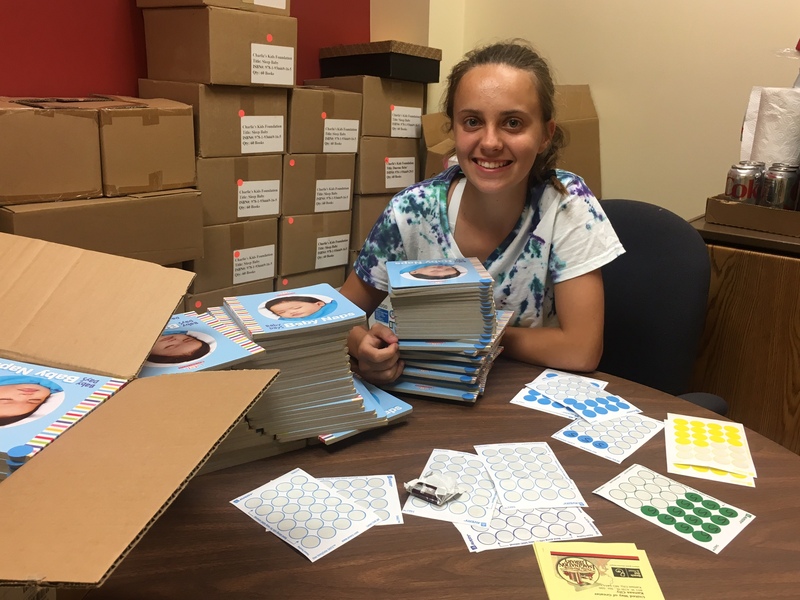 Office volunteers do various tasks as-needed, including stuffing and stamping envelopes for mailings, putting stickers on books (to color-code them for specific age groups), and database entry. 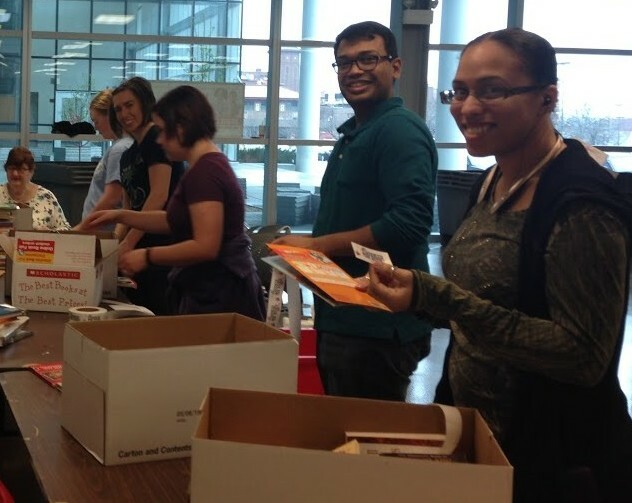 One-time volunteers assist us with office tasks as well, often sorting or labeling books. 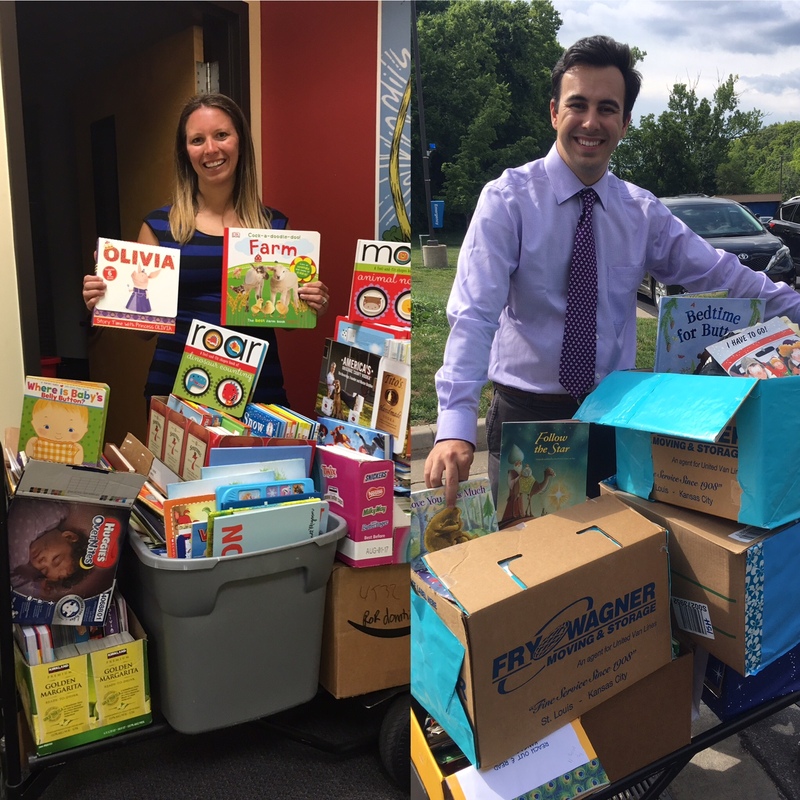 Groups from various community organizations or corporations visit our office to help us get through the large number of books that come through our office on their way to one of our 52 clinics. Community volunteers label and sort Hooked on Books donations. 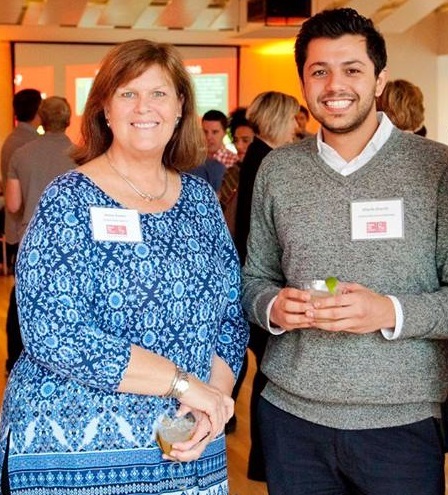 Event volunteers allow us to hold successful annual fundraisers and book drives. 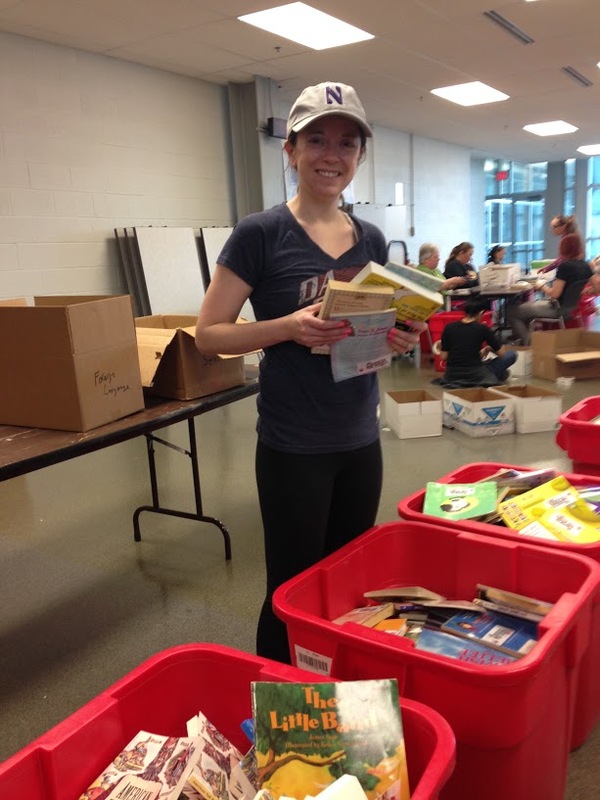 Last March, we had volunteers sort and haul over 24,000 books from our yearly Hooked on Books school book drive and competition. These books are used as waiting-room books in our clinics, and over half of the books were donated to other local agencies and schools. Volunteers also set up and cleaned up after our Green Eggs and Ham Breakfast, and directed attendees to the event space. Committee volunteers share their professional expertise and help us successfully run our program. This involves event planning, serving on our council, and much more. 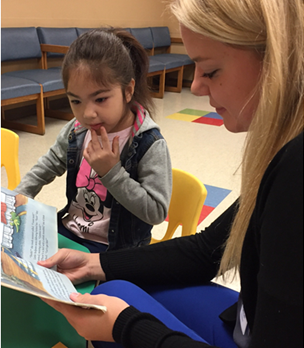 Because of our volunteers, we are able to fill KC kids’ lives with stories and prepare them for success in school, and eventually in college and careers. These books give them the developmental boost that all babies need as well as fond memories of imaginative stories shared with loved ones. 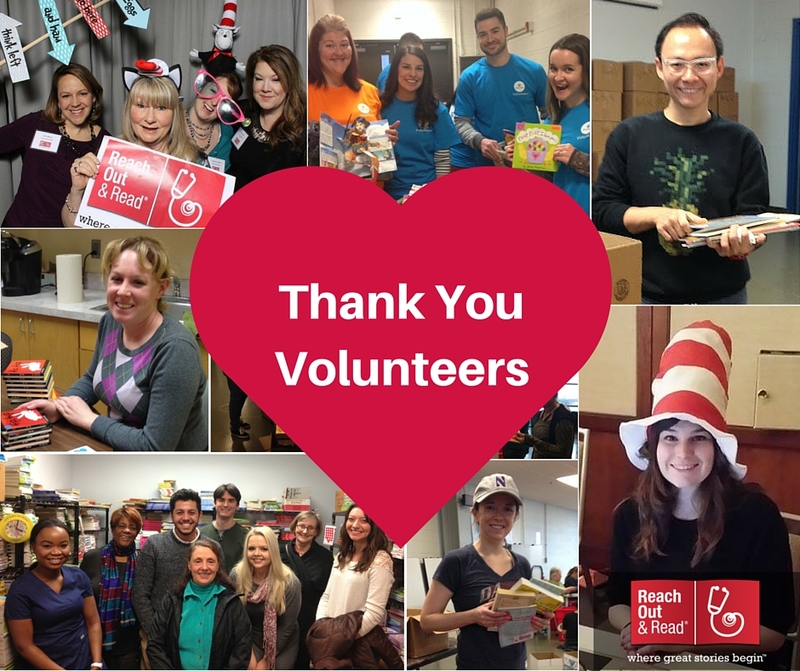 Because of our volunteers, we were able to reach 76,000 children all over the Kansas City area just last year. If you are interested in becoming a volunteer for RORKC, contact Jenny. The Still Face Paradigm comes from a series of studies by Dr. Ed Trunick. In these studies, each mother would interact with her baby by cooing, gesturing, and touching, back and forth. Then, on a signal from the research team, the mother would become still faced, no longer interacting with her baby. 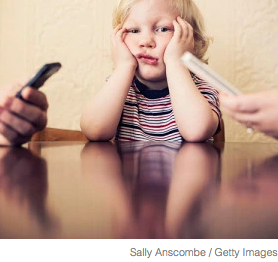 Dr. Needlman explains that this still-faced behavior is much like the behavior of a person who is preoccupied by a mobile device: They remain impassive, show little or no facial expression, and do not actively interact with those around them. This may be appropriate at times, and smartphones have many advantages that are hard to give up. However, screen focused behavior is something to be mindful of, especially around young children. Like second-hand smoke, second-hand screens may pose a risk to those other than the user. 1. Tune in to what the child is interested in and respond to that interest. 2. Talk more by engaging in frequent and high-quality speech with the child. 3. Take turns by letting the baby participate and responding, back and forth. Sound familiar? These behaviors are much like what the “Still Faced Experiment” mothers did before they were instructed to make their faces blank. 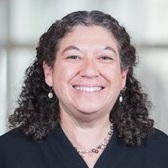 Of course, you can’t effectively “tune in” and “take turns” when engrossed in content on a screen, which is why Dr. Suskind adds a fourth guideline: Turn it off. As in, turn off distracting devices when spending time with your child. Besides we can think of a fun activity that doesn’t require any screens: Reading a book! 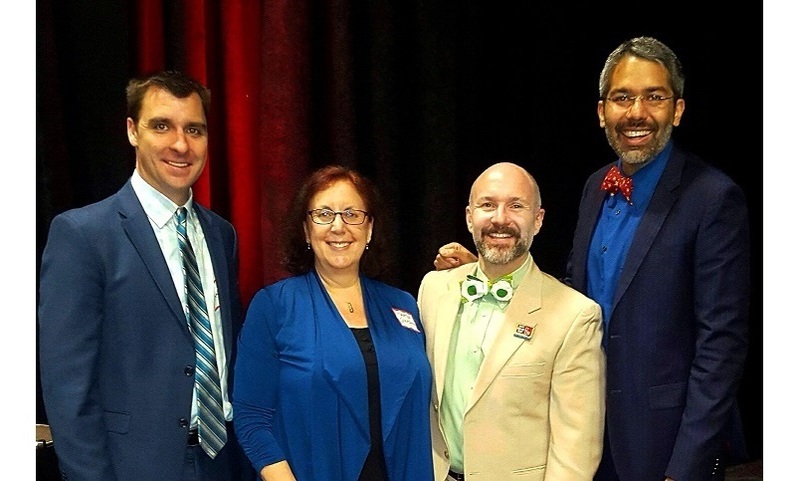 10th Annual Green Eggs & Ham Breakfast: A HUGE Success! We had a fantastic time at the 10th Annual Green Eggs & Ham breakfast. Over 300 people attended, and we raised $70,000 and counting. That’s 14,000 books that kids in the Kansas City area will receive at our clinics! If you missed the opportunity to contribute, it is not too late: Donate here. We also heard a wonderful keynote speech from Dr. Dipesh Navsaria. Access the presentation slides here. Thanks again to our top level sponsors: The Walsh Family and Kelly Family Foundations in honor of Betty Keith; Pamela Miller and Michael Cummings in honor of Mary Jo Williams; Hallmark Cards, the Ewing Marion Kauffman Foundation; and to all other sponsors, table hosts and supporters. Because of you, Green Eggs & Ham 2016 was a huge success and tons of fun. for an average of 13.4 books per student. Hooked on Books is our annual city-wide book drive and friendly competition between schools. 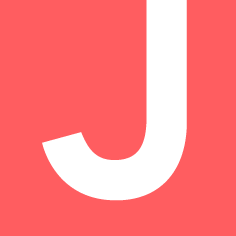 It originated 17 years ago as a joint initiative of the Junior League of Kansas City and the KC Star. 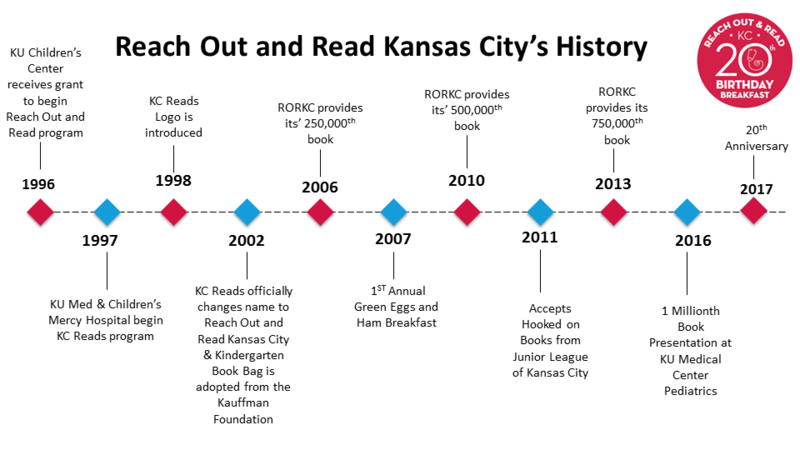 Reach Out and Read KC adopted the program in 2010, and it has continued to be a successful book collection program over the years. 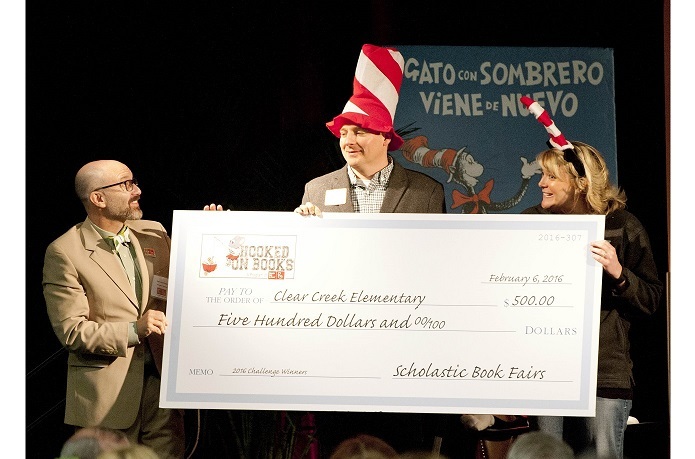 The winning school is determined by the ratio of books collected per student, and the winning school receives bragging rights, a $500 gift certificate courtesy of RORKC and Scholastic Books, a celebration assembly, and a teacher gift basket courtesy of California Pizza Kitchen. 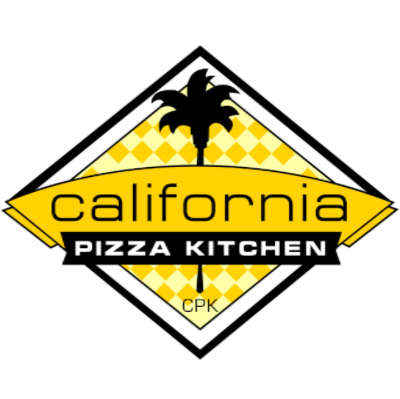 All participants receive a bookmark and a coupon for a free kid’s pizza at California Pizza Kitchen. 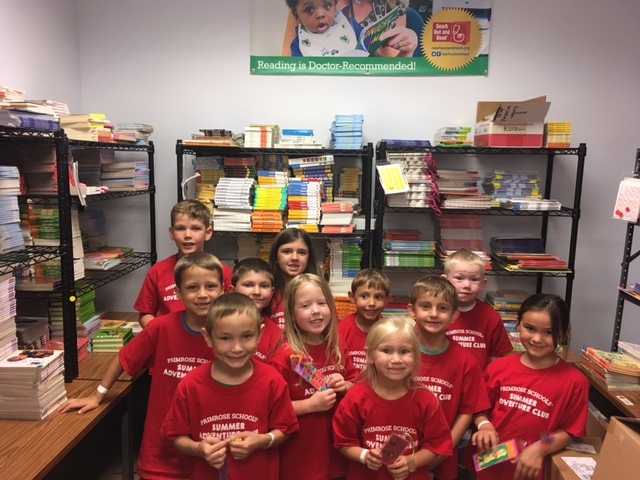 This year, we had 19 schools and Rainy Day Books collect a grand total of 24,033 books that will be given to RORKC clinics as well as multiple local nonprofits and schools. 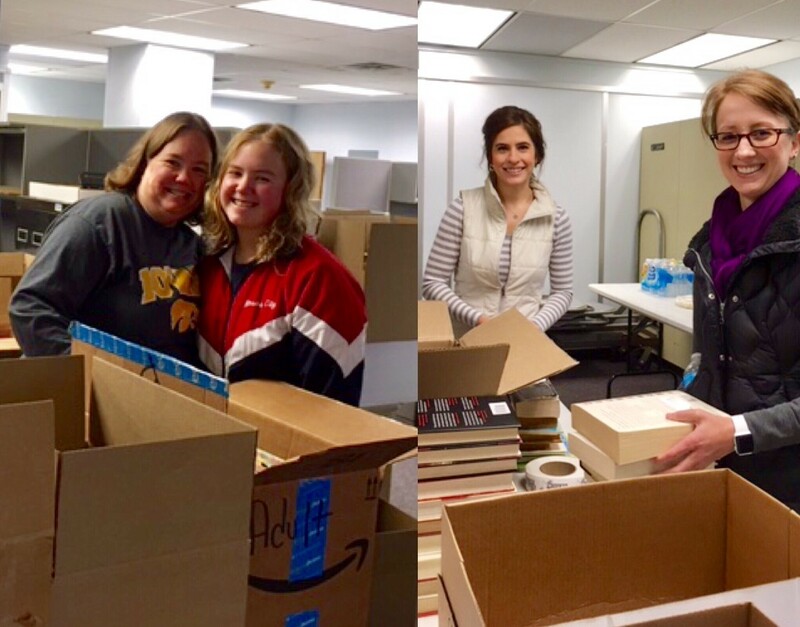 With the help of the Junior League of Kansas City and the KC Star, we will be sorting and distributing these books to local agencies during the month of March. 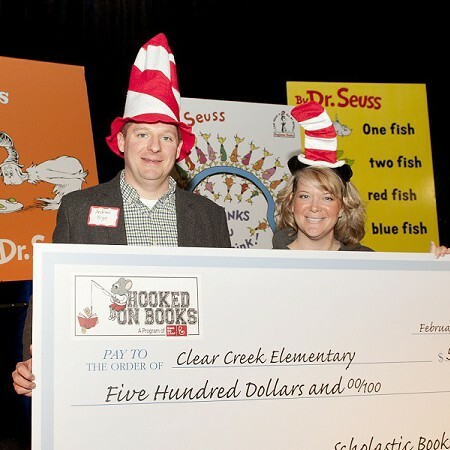 Congratulations to Clear Creek Elementary, and thank you to all the schools and volunteers who helped us with this year’s Hooked on Books school book drive!! 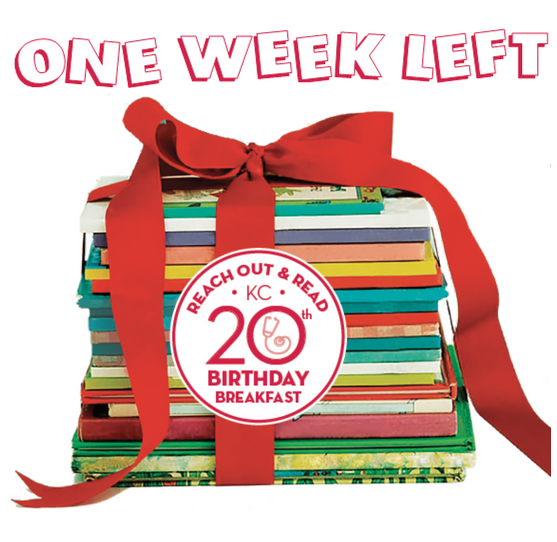 Reach Out and Read KC is always trying to provide more books to more kids in the Kansas City Area. Because of your continued support, we have been able to give over 1700 more books to more kiddos at well-child visits in the first half of this fiscal year than we did in the first half of last year. 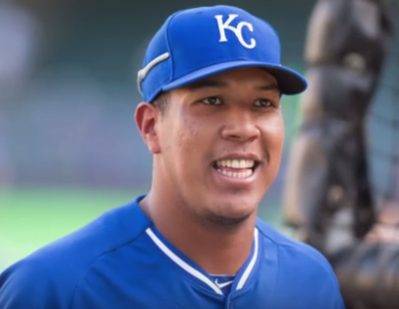 This is such good news for us and for KC kids! Thank you for helping us make it happen. You are invited to Reach Out and Read night at California Pizza Kitchen on Tuesday, March 1st from 4:30-9:30pm. Not only will there be many kinds of delicious pizza, but a percentage of the proceeds will benefit Reach Out and Read KC. Join us for dinner or order take out or catering for the evening while supporting RORKC. We hope to see you there! 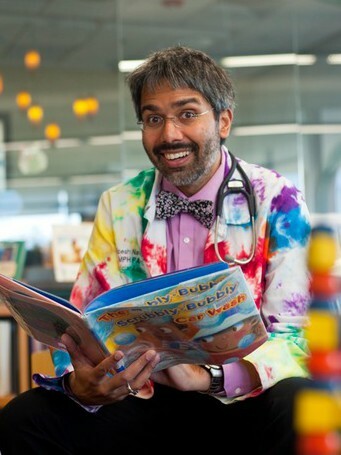 We are delighted to have Dr. Dipesh Navsaria as our keynote speaker for the 10th Annual Green Eggs & Ham Breakfast on March 4th. Tickets to the event are available now. 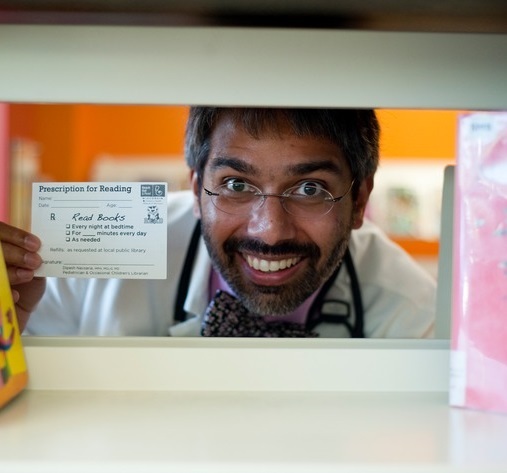 Dr. Navsaria is the Medical Director for Reach Out and Read Wisconsin. 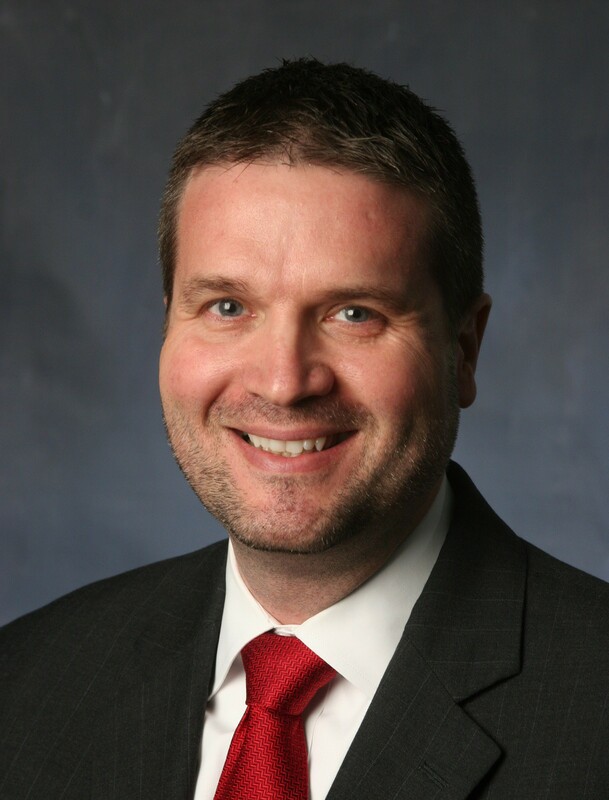 He is a pediatrician with experience as a children’s librarian, a professor of pediatrics, and an advocate for children’s health. 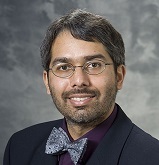 Dr. Navsaria also has more degrees than a thermometer and wears really excellent bow ties. Hooked On Books collection day is Tuesday, February 23, from 9am-2pm. We are looking for volunteers with strong backs for lifting boxes of books and large vehicles for transporting them (up to 20 copypaper sized boxes at a time.) 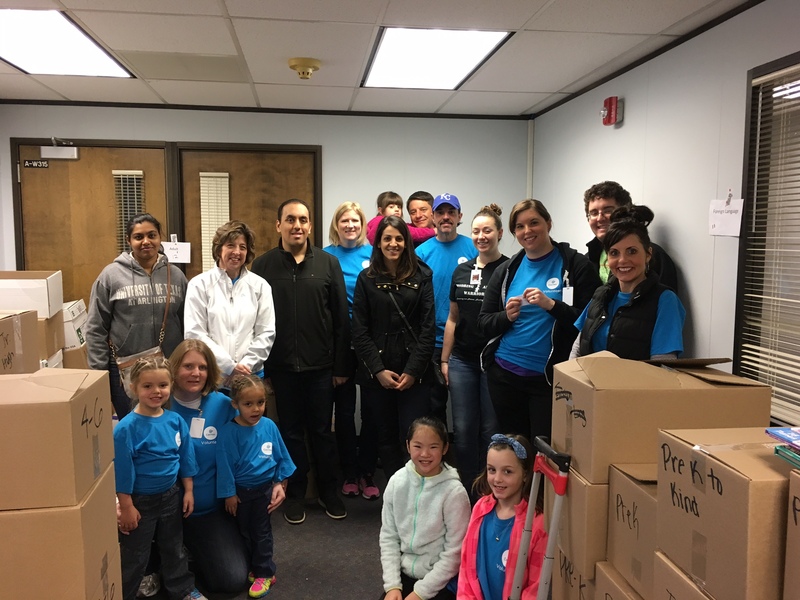 Volunteers will be assigned to pick up books at schools located throughout greater KC (from DeSoto to the West, Overland Park to the South, Raymore to the East, and Smithville to the North,) and deliver them to the KC Star loading dock in the Crossroads. We’ve got boxes full of books! 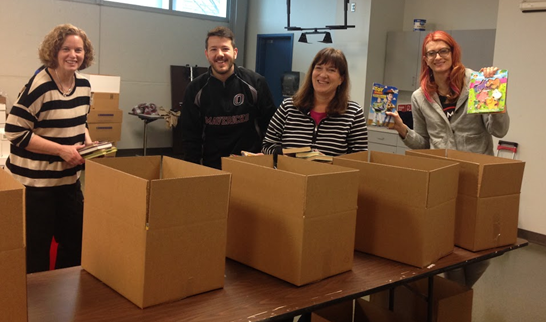 We also need help on Saturday, March 12 from 9am-3pm and Saturday, March 19 9am-noon at the KC Star when we label, sort, and pack up our “Hooked on Books” books. Click here to sign up for a 3 hour shift. Read a book with your loved ones. Set aside some time to relax and get comfy with a good book to share with your favorite kiddos. Let us know which book you shared by tweeting us @rorkc! Print free bookmarks and bookplates from the International Book Giving Day website. Donate to Reach Out and Read KC and we will do the work for you! 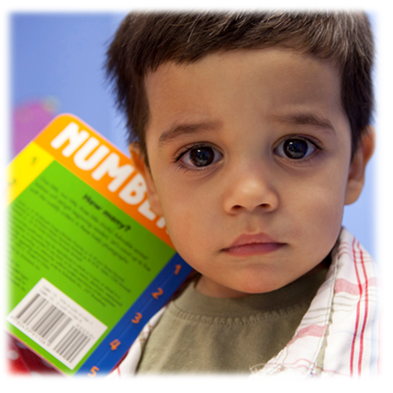 We will use your donation to order and deliver age-appropriate books for children who visit our clinics for well-child check-ups. 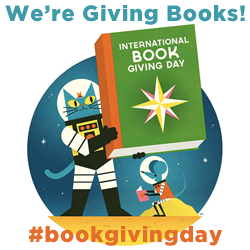 Click here to donate, and enter “International book giving day” in the special instructions section. 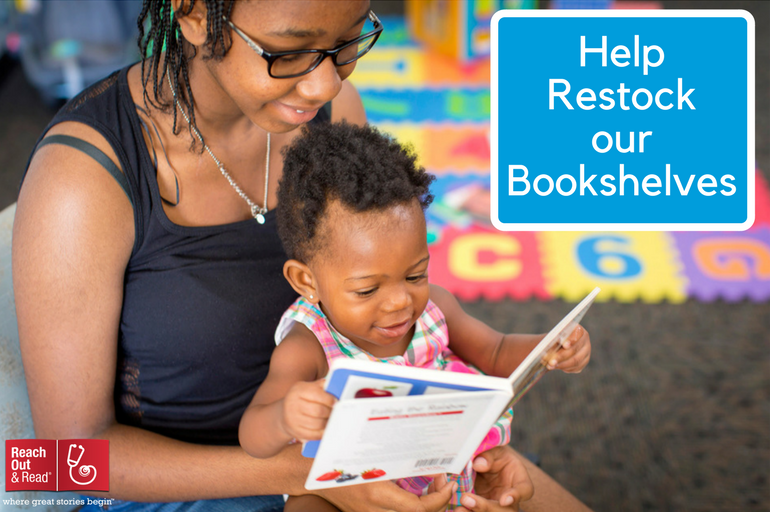 $60 will provide a whole course of books for one child–that’s 15 books! The benefits of reading to children are numerous, and we appreciate any and all the work you do to bring about these benefits. 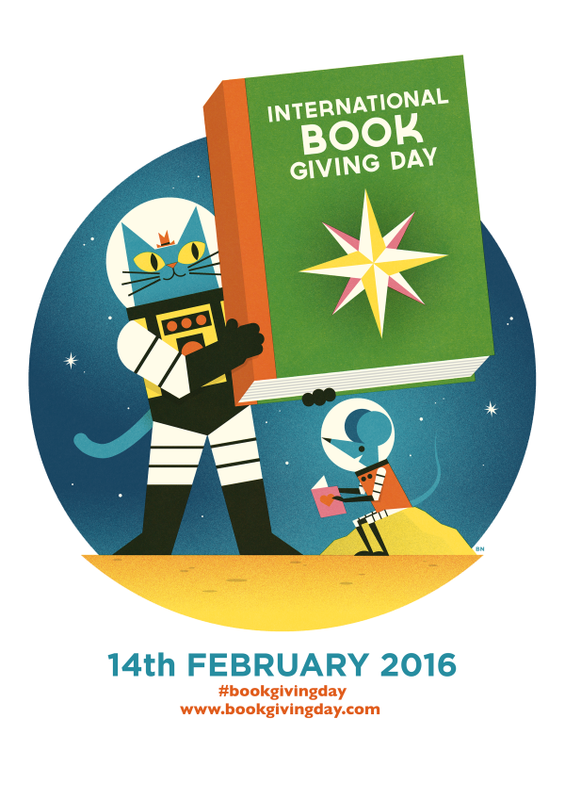 We hope you find some time to read and enjoy this year’s International Book Giving Day! 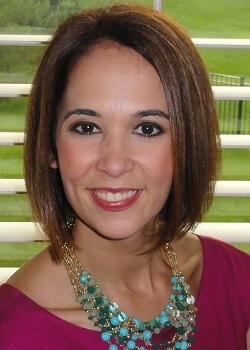 10th Annual Green Eggs & Ham Breakfast Speakers Announced! 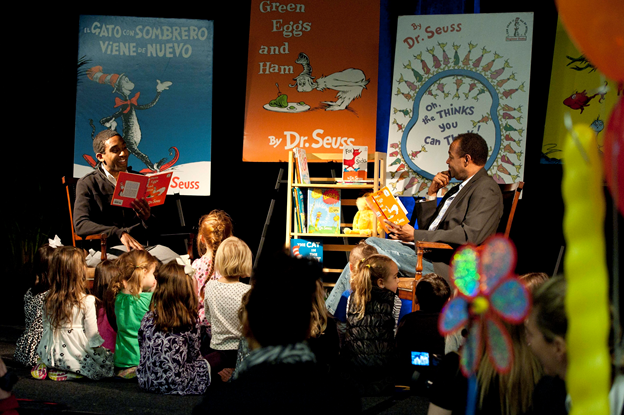 The 10th Annual Green Eggs and Ham breakfast to benefit Reach Out and Read KC is coming up on Friday, March 4 from 7:30-9am. This is our biggest event of the year! Tickets are on sale now for $60 each, and the last day to get your ticket is February 26. Complimentary parking is provided, and a map of the location can be found here. Registration and coffee begins at 7:00am. We look forward to seeing you there! Hooked on Books 2016 is Underway! Hooked on Books is back for 2016! Between January 11 and February 19, schools throughout the metropolitan area will collect new and gently used books for disadvantaged children ages newborn to 14. The books will then be redistributed to schools and other nonprofit organizations. All students at participating schools receive a bookmark and coupon for a free kids pizza at California Pizza Kitchen, and the winning classroom is entered into a drawing to win a pizza party from CPK, along with bragging rights, and a $500 gift certificate from Scholastic Books! Winners will be announced at our annual Green Eggs and Ham breakfast on March 4. There is still the chance to get involved! 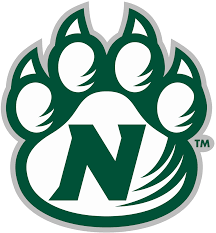 If you would like to volunteer as a school liaison, contact Jenny at Jhorsley@kumc.edu. For nonprofit organizations and schools serving at-risk children, apply to be a book recipient. For further information, visit our event page. the two newest members of the Reach Out and Read Community Council! Books and reading have always been a large part of my daily life. I was encouraged to read as a child and this has stayed with me as an adult (I’ve been in a book club for many years). I believe humans share a special connection with a physical book which cannot be easily replaced with modern technology. Working with an organization which provides something so special during critical phases of development would be an honor. I know that being a good reader has made my life easier, both in school and on the job. It has also been a wonderful way to escape in times of stress. I have been blessed to share that joy with both of my two sons, Carter, age 6, and Grayson, age 2. 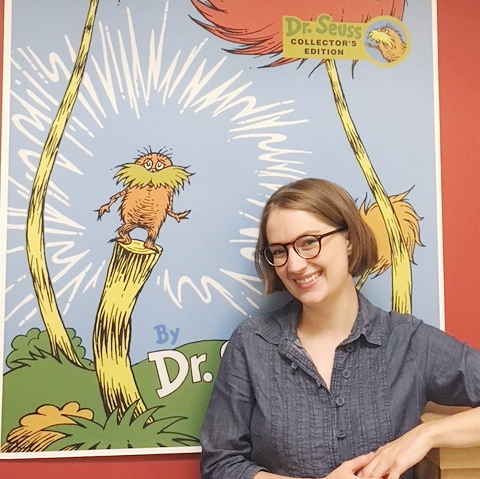 When I found RORKC, I started as a volunteer reader in the clinic at KU Prairie Village, and I loved being able to share that joy with the children that I saw each visit. I look forward to helping the program thrive and help give the area’s children a much needed boost in the right direction towards success. We are thrilled to report that the Every Student Succeeds Act has passed. This piece of legislation recognizes the importance of pediatric literacy organizations, such as Reach Out and Read. The Every Student Succeeds Act was to developed to ensure quality education for all children. This act received overwhelming bipartisan support, including votes from some Kansas and Missouri representatives. The Every Student Succeeds Act can be read here. 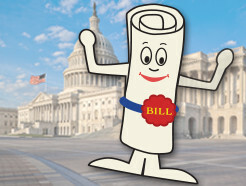 There are sections of this act that encourage funds for preschool and other early childhood education programs, support programs that involve parents and family members, and encourage children’s literacy and early childhood literacy preparation. This looks like a great step and we look forward to seeing how this law improves education and literacy preparation for children.